On Sept. 19, 2003 World Wide Railroad Newswire Altamont Press runs famous West Texas Camel/ Train photo as photo of the day!! I had passed location of this herd for over 20 years going to visit relatives in Iowa Park, Tx. About 10 years ago I first heard of this bunch of camels from my wife who spotted them on a trip there with a friend. Ever since I wanted a photo but they were either hidden in mesquite trees out of sight or too far away. And never had a train been around regardless. But I got my dream which I posted before leaving on my 350+ mile journey as the #1 of several railfan goals for our trip. Are they decendents of camels released by army? Maybe not. But they run wild in probably a section of desolate West Texas with US 287 on one side and BNSF Wichita Sub on other. And I have found kids of all ages love not only trains but camels too!! Read comments from other railroad fans as well as noted historians below. This is fun!! Actually there are three herds of camels within a thirty mile radius of Wichita Falls. Two are along the BNSF (ex-FW&D) mainline. The first is at Dickworsham, about five miles east-southeast of Henrietta. The second is along US 287 about five miles west of Iowa Park (near Burnet Road). This heard is also along the BNSF mainline but is not as photogenic as Dickworsham. The third heard is near Dundee in northwest Archer County. Since the Wichita Valley was abandoned years ago, no trains pass this location. All three herds are used by ranchers to control mesquite. Yes, it was true that camels were used in Texas in its early days and were later set free although it is doubtful that these herds are descendants. Great balls o' fire, what a DIT (Day in Tx) shot that would make! It looks like that DPU was really "humpin' it." Great shots, Bob! Steve G, is there a trick/secret to getting to the location you detailed (near the roadside park)? How often do the camels get this close to the track there? Which side of the track (east/north or west/south) are they on? TIA. The camels (about 16 of them) are located in a section of pastureland about a mile to a mile and half in length by as much as a quarter mile wide. The area begins south of the roadside park and continues north all the way to a road which crosses the tracks at Dickworsham. The area is east of US 287 and west of the BNSF so lighting is best in the afternoon. There are basically only two areas in which you can get the camels in a photo with trains. When they are at the southmost part of the land (near the roadside park) or when they roam to the far north end of the land near the dirt road which crosses the tracks. Anywhere in between they are either too far from the tracks or are hidden by trees. Like I said earlier, the all time best location is to shoot pix when they are just south of the roadside park area. You can stand on the hill that the park is on, shoot back to the east at the camels and line up several red rock formations which are next to the BNSF line on its east side. I have shot several trains here over the years with my favorites being whenever a red & silver warbonnet is on the lead. (something appealing about a Santa Fe unit and camels). At the roadside park location it really wouldn't matter which direction a train was heading since you are shooting straight across to the tracks. At the north location (depending on how far north the camels are) would depend which angle you might be able to get. Best would be northbounds if they came all the way up to the gate. of what would depend would be just plain luck. Let me know if you ever plan on coming up and spending a day shooting at Dickworsham. I'll drive down and meet you. Its about 22 miles from WF. BTW- Dickworsham is the first major passing siding south of WF and is quite busy. It is located between Henrietta and Bellview in Clay County. "Boxcar" Jim Satterwhite (Of Coast Line Rail, Railspot, Washington Post, and Trains Mag. fame) sent me a note after hearing about and seeing my Camel shots with BNSF in West Texas that I should send to Altamont Press for National exposure. I did and just discovered that it was published 9-19-03. I guess all those years waiting for that right moment proved fun to more than me. Thanks Jim. Congratulations Bob, you're now famous coast to coast just like the Satterwhiteknight brothers. Down at the bottom of the Altamont press news page is a disturbing story originally published in the Houston Chronicle. "Culberson move puts rail funding in jeopardy; Metro may try to change ballot wording to save plan"
Seems like DeLay and his cronies are determined to make Houstonians choke on their exhaust fumes or pay for rail out of their own pockets again. and then click on September 19 AND THERE IT WAS!!! You might want to share this with others so they can actually see the "camels". 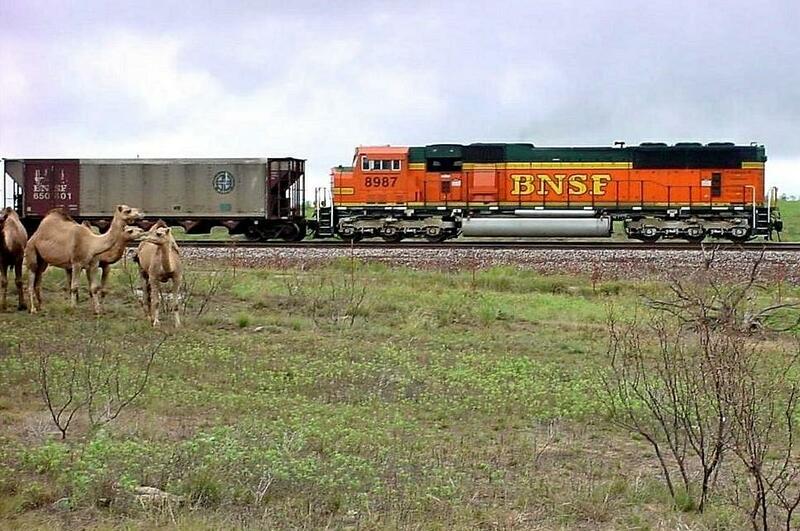 Your photo #30245 on railpictures.net has a lot of us very curious -- it shows wild camels in Texas! I had no idea that camels ran wild in Texas... could this be some sort of wildlife refuge or something? Anyway, it is a terrific and eye-popping photo!